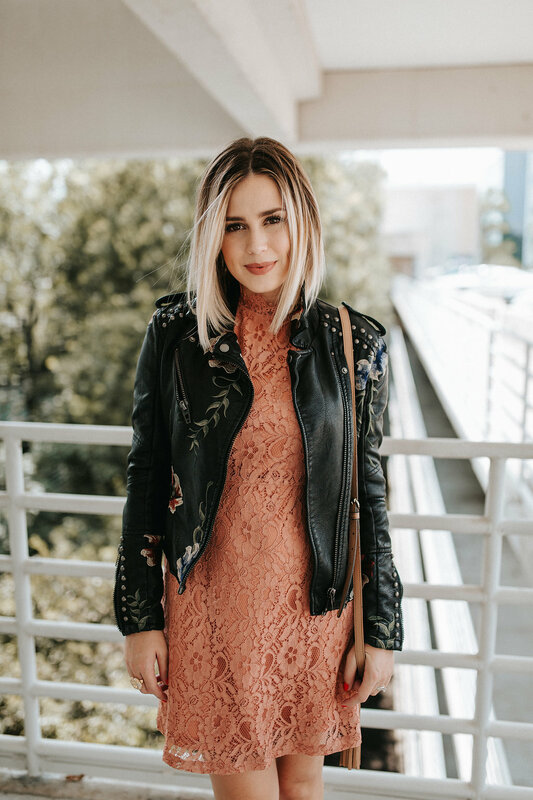 Nothing says Fall better than a great looking floral leather jacket. Add a lovely lace dress and you are set for a girls night out or even date night. I am SO glad I got this BlankNYC floral leather jacket last year. It was actually Jordan who bought it for my birthday present (I have taught him well). One year later, this jacket is still hot, and one of my favorite jackets in my closet. I would suggest going up a size because it is a bit snug. I can only wear this jacket with light layers, not that it gets that cold in Houston anyways. But you catch my drift. Let’s move on to this GORGEOUS dress. Can you believe its $35! I love the pink/salmon color. I really like the high neck detail as well; it’s different and ladylike. 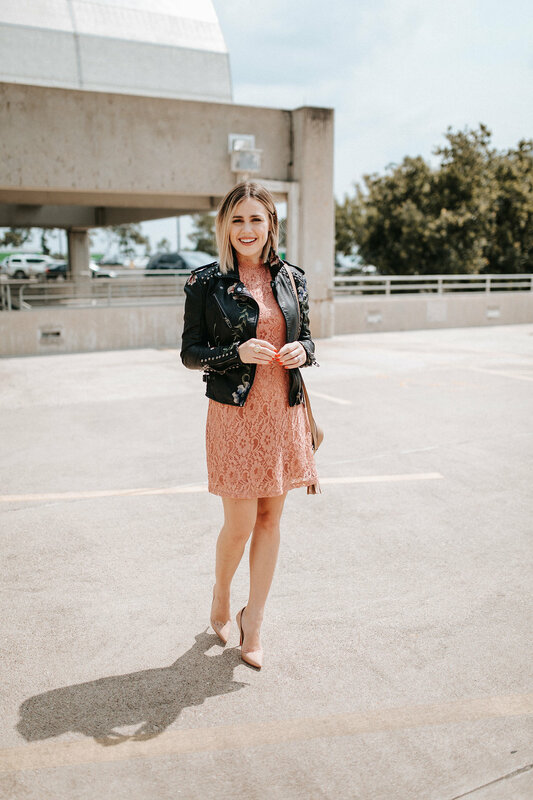 Perfect for a girls night, date night, or even for the 9-5 job. The drop ruffle sleeves are so adorable and in trend, but isn’t over the top… just my cup of tea. The slight a-line tailoring of the dress allows it to fit different body type, while still keeping it flattering. 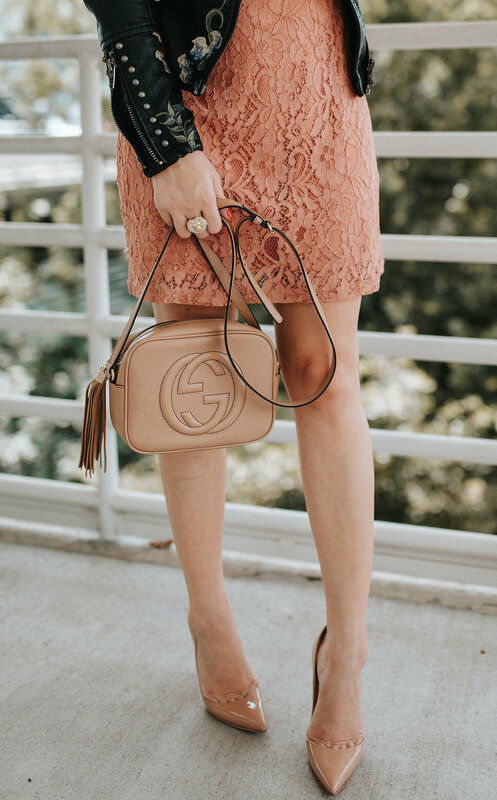 This lace dress is a great dress to be dressed up or down with ankle boots. I just ordered these Steve Madden boots, and I am just picturing the outfit (the dress with the boots). Ahh, now I just need cooler weather. I’m so over this Houston heat! Short and sweet today guys, have a great day and I’ll see you back here soon. Thank you so much for stopping by! 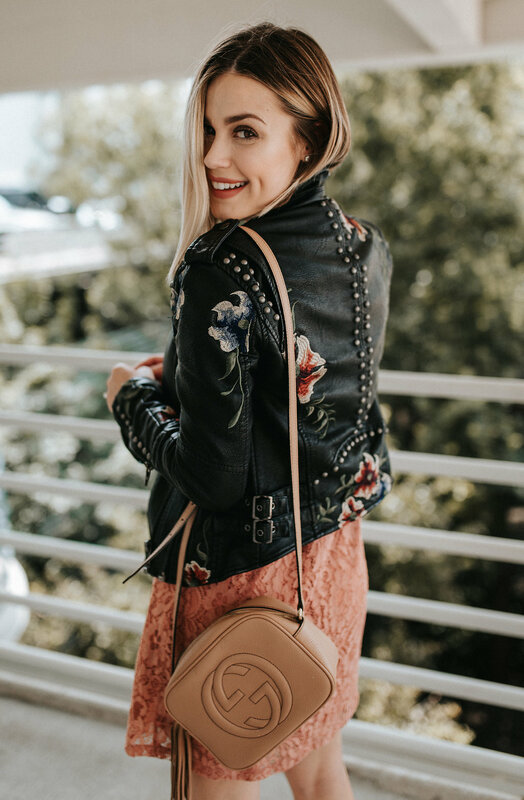 What a great way to combine the floral and leather trends. Cute! Such a gorgeous lady with a great sense of style! I love your princess meets rock n’chic outfit! This jacket is a stunner! I love the contrast of rocker and feminine! Amazing leather jacket. 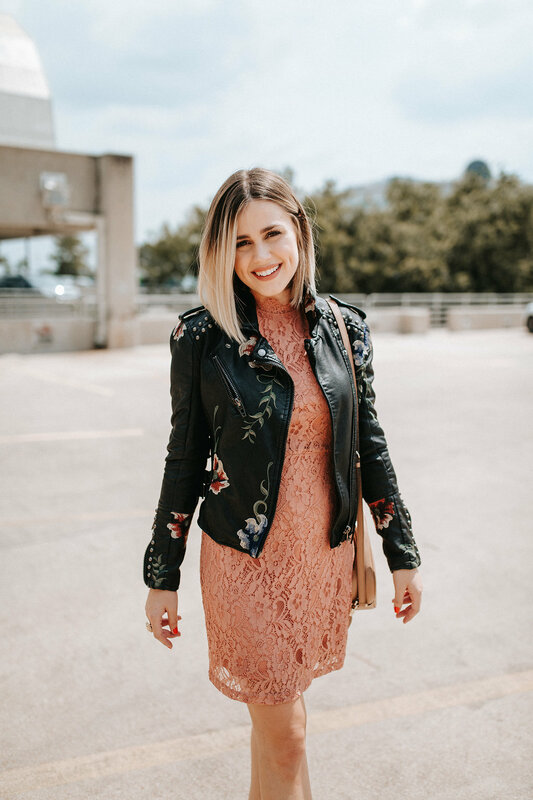 I love this floral leather jacket. Such a awesome design this jacket. I am impress from this jacket. I would like to take such a jacket too. Thanks for sharing the great information. Good Luck!